With busy class schedules, homework, exams to study for and papers to write, not to mention wanting to have something of a social life, trying to stay fit in college can really be a challenge. On top of this, many students hold some form of a job where they work between 10 and 25 hours on any given week. Whether you are an undergrad or graduate student, the same thing applies. When all this stuff is on your plate and the schedule continues to fill up, one of the first things that tends to get pushed to the side is getting to the gym! Here are five tips that will help you stay fit during your education. Just like you schedule a time to write a paper or study for an upcoming exam, do the same for a time to work out. If you use an agenda or a mobile calendar, set aside at least 30 minutes to be active during your day. Many studies show that those who exercise on a regular basis actually get better grades and have more concrete, focused study habits. Whether your campus is small or large, simply biking or walking to class can help to keep you fit. 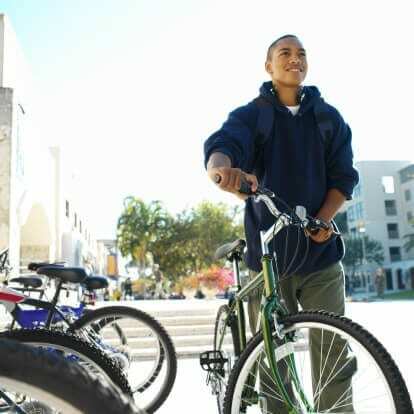 Plan your day to leave enough time so that you can make the bike ride or walk to class and still get there on time. If you do happen to commute far enough that you must drive to campus, try to leave your car parked further away so you can bike or walk the rest of the way to class. Additionally, you can take some time to walk or ride after lunch, before the next class begins or at the end of your busy school day. Healthy eating on campus can be one of the biggest challenges for students. Due to the demanding schedule and often being on a “time crunch,” it’s easy to simply just grab and go, with thoughts of nutrition going out the window. But by simply watching your diet and walking, you can keep yourself more fit without much effort. Try to pack your lunch choosing healthy foods to eliminate the fast food stops and be certain to carry around a water bottle to drink as much water as you can throughout the day for proper hydration. There are many benefits to working out with others. Having a workout buddy or small group that plans to meet at the gym on certain days will help you to stay on track. If you have the accountability as well as someone banking on you being at the gym, you are far more likely to actually get there and get the work done. Find someone with similar workout goals and interests and start planning to go together. Everyone needs to take a break from studying. Set a schedule where you use one of those breaks to get over to the gym for a workout. It will allow you to focus better, clear your mind, and be ready to get back to it once you are done. Study for a few hours, take an hour to get your workout in, and then get back to it! Regardless of your level of education or area of study, adding in a workout will benefit you in more ways than just staying fit. If you are having some trouble trying to fit in exercise with the busy demands of school, try to implement these five tips! This blog was written by Amanda Bireline, Fitness Center Manager. To read more about the NIFS bloggers, click here. Busy college schedule? No time to fit in your workout between exams, papers, and class? Don’t let school be the excuse to skip or miss your workout. According to The Lancet, people who exercise as little as 15 minutes a day have a 14% lower mortality risk than people who don’t exercise at all. Just remember, something is always better than nothing! Here are some quick workout options, that require dumbells or kettlebells, that you can do if you are short on time. No equipment, no problem. You can still get in a quick workout. Just because you do not have weights available doesn’t mean you should skip. Always remember, something is better than nothing! “No time” should never be the reason for not getting in some strength movements as a student. If you need more help for quick workout ideas, stop by the track desk at NIFS and a trainer can help you out. This blog was written by Kaci Lierman, Health Fitness Instructor and Personal Trainer. To read more about the NIFS bloggers, click here.